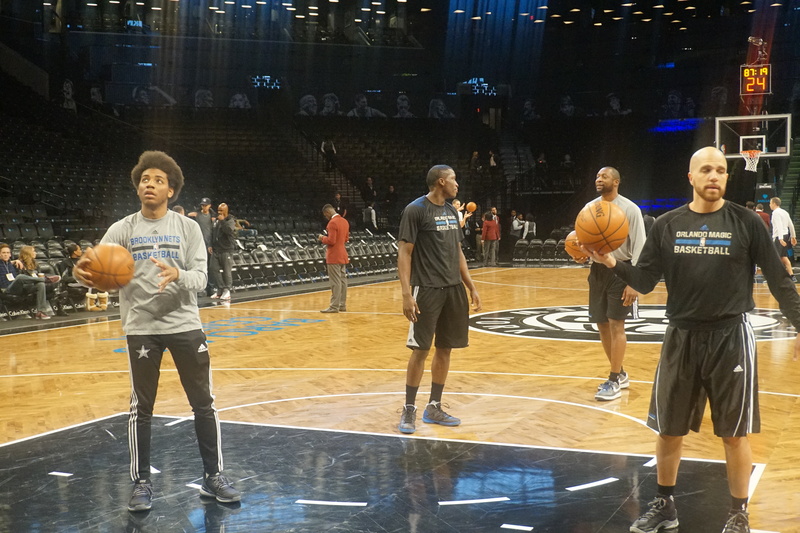 As the Nets continue to recover from injuries to key players they took on the Orlando Magic Friday night. Shane Larkin once again got the start for the injured Jarrett Jack who is out for the season. The Magic also dealing with injuries at the point guard position came into this game on a four game losing streak, they like the Nets were looking to get a much needed win. Victor Oladipo got the start at the point guard position for the visiting Orlando Magic who were without Elfrid Payton. The first quarter was not indicative of the rest of the game. The game started out very well offensively for the Magic as they shot 50% from behind the arc and jumped out to an early 13-point lead. Tobias Harris, a New York native, hit the first shot from behind the arc for the Magic giving the Magic the early 13-6 lead and forcing Lionel Hollins to call an early time out. The Nets managed to score only 17 points in the first quarter and shot a dismal 33.3% from the field while the Magic shot 45.5% in the period. The second quarter changed the fortune for both teams, the Magic went artic cold from the field as they only made 4 shots in the period and scored 11 points. The Nets stepped up their defensive pressure as they forced 6 turnovers in the quarter. The Nets scored 21 points and took the lead for the first time after Joe Johnson hit a corner 3 with 3:51 left in the half giving the Nets a 35-33 lead. Then as time expired in the half Wayne Ellington hit a 3 to beat the buzzer giving the Nets a 38-37 lead and some momentum going into the 3rd quarter. Both teams were better offensively in the 3rd The Magic shot 41% from the floor and the Nets shot 56.3%. Joe Johnson had 8 in the period as he looked to shoulder some of the scoring responsibilities for the team. Tobias Harris had 7 going into the period but was held to only 2 points for the rest of the game. Johnson and Harris seemed to have a little battle between them in the 3rd as Joe came alive especially when Harris was on him. There were several plays where Johnson went at Harris in one on one situations. The fourth quarter was the story of the game, the Nets were unable to score or put defensive pressure on the Magic. They scored only 15 points while allowing the Magic to score 23. Victor Oladipo had himself a career night from behind the arc as he hit 6 treys and seemingly hit one every time the Nets tried to make a run to close the gap. 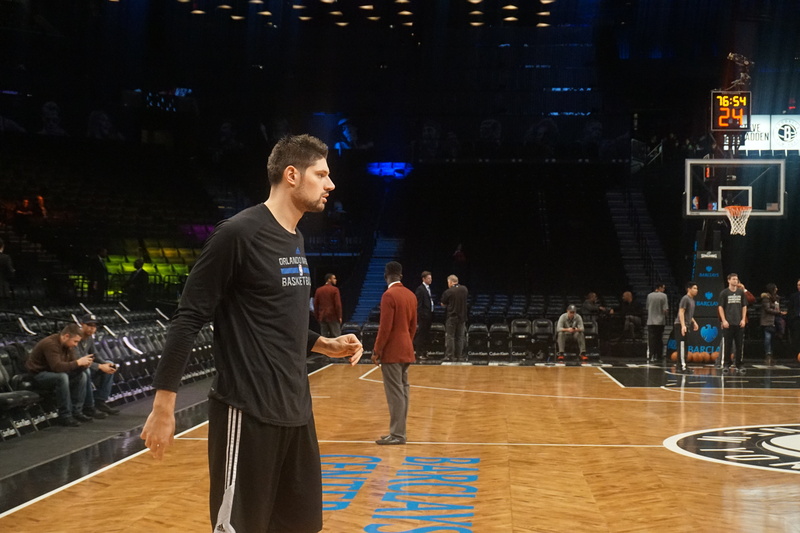 Nikola Vucevic always seems to have big games against the Nets. He had 20 points tonight however he went 9-23 from the floor. The Magic also had good contributions from Aaron Gordon (14-points) and Evan Fournier (13-points). 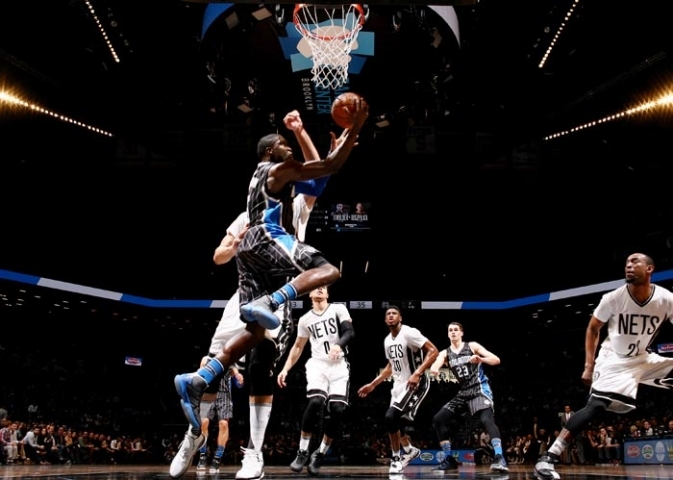 Gordon had two huge uncontested dunks in the fourth quarter to seal the victory for the Magic. The story of this game was the Nets inability to defend the 3. The Magic shot nearly 50% for the game as they hit 13 of their 27 attempts from behind the arc. The Nets just could not make shots consistently tonight, shooting 39% for the game from the floor, and 31% from 3 and they also shot 60% from the charity stripe. Brook Lopez battled valiantly against Nikola Vucevic however frustration could be seen in the locker room as it was a somber atmosphere after the game and after the Nets 9th straight home loss. Shane Larkin did well as he continues to start in the absence of Jarrett Jack; he had 12 points and 3 assists as he matched up with Oladipo for most of the night. This is the second straight game where the nets failed to score over 80 points. As their offensive woes continue they look to bounce back from this loss when they face the Detroit Pistons on Saturday night on the road.